Who do you walk for? Show the person in your life who is fighting MS your undying support when you wear this MS awareness t-shirt. They'll love and appreciate how much you support them and the fight for a cure to this disease. Our MS t-shirts are printed on 100% cotton t-shirts, machine washable in youth sizes XS-L & adult sizes S-3XL. Free personalization of any name is included. Happy with this T-Shirt and the lower printing came out great! Daughter loves shirt. Orange isnt what it appears and shirt isnt preshrunk. Design is iron on. I love what i ordered. I love being able to personalize your T-shirts. Especially the ones from a previous order where I ordered the same style shirt for several individuals and each one can be unique. 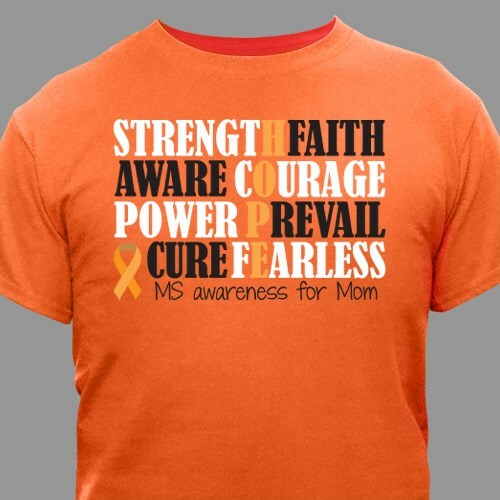 Additional Info Shop our HOPE MS awareness apparel and gift line to provide courage, strength, and hope to the people in your life who are battling MS. A portion of your purchase will go directly to the charity or cause of your choice.